Aquatic invertebrates are found in every kind of stream, wetland, and spring habitat, from riffles and pools to leaf packs, woody debris, plants, cobble, and sand. Assessing the community diversity and composition reveals the biological condition of a site, and provides insight into possible stressors. I conduct standardized aquatic macroinvertebrate sampling, use predictive models and/or multimetric indices to determine site biological condition, and analyze taxonomic and ecological traits to provide a comprehensive picture of biological health and ecological function. Assess biological condition to provide pre-restoration baseline data, determine the effectiveness of aquatic and upland restoration projects, and investigate the occurrence of rare endemic as well as invasive species. 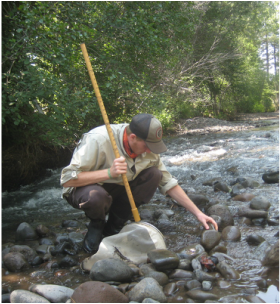 Developed suite of aquatic invertebrate indicators as part of US EPA Region 10 Streamflow Duration Assessment Method for Oregon, Washington, and Idaho.